I’m a literacy lover…getting my Masters of Education in Reading makes that pretty evident. So, when it comes to teaching math in the classroom I often felt like I was doing a terrible job. My brain does not go the math route. And trying to convince my learners that math was amazing got a little challenging. I could have spent hours reading up on teaching math to learners or going to workshop after workshop to find the best techniques for my learners. But, with everything else that was already on my plate, I honestly didn’t have that kind of time on my hands. Instead, I decide to try methods that worked in my literacy instruction first. In my literacy block, my learners has a variety of experiences available to help them grow as readers and writers. But, in my math I found myself using the workbook with manipulatives. I mean…really?!?! How could I expect my learners to grow or even enjoy math without giving them the opportunities to experience math in different ways. How do you give your learners math experiences that help them to enjoy and engage with the math concepts you are teaching? Let me give you some examples with shape experiences for little learners. I’m a visual learner. If I can’t see it chances are it is not something I am going to remember. For those visual learners in your classroom it is important to provide a visual resource they can use. When we are beginning a new math unit I try to introduce the key vocabulary my learners will be hearing throughout the unit. Math anchor charts created together, posters hanging on the wall or vocabulary cards on a math word wall are great visual resources to have around during math instruction. You can grab these shape posters by clicking the MJCS download image at the bottom of this post. A lot of our math centers are whole group activities turned small group activities. For our shape unit, we have shape hunts quite a lot. This Shape Hunt is a great way to get those kinesthetic learners up and moving with a mission on their mind. Post the shapes around the room with sticky tack . 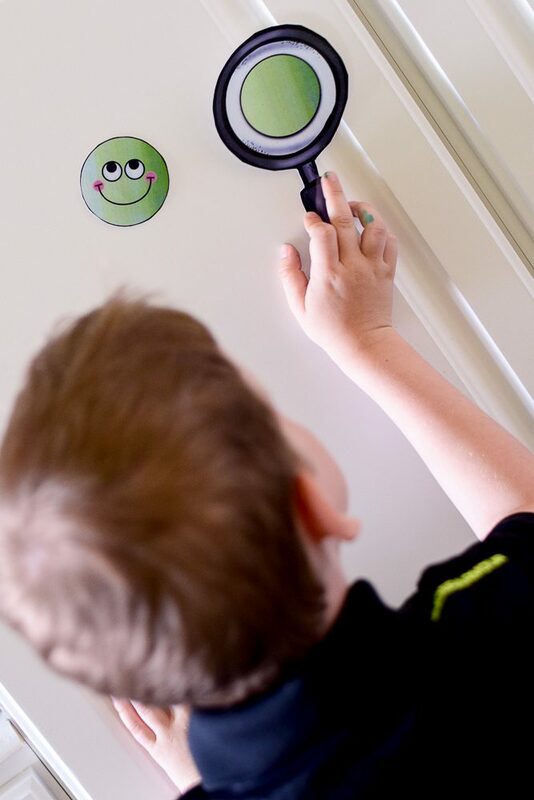 Give a group of learners a shape magnifying glass and send them off on a shape hunt. When they find a shape have them bring it back to whole group. And, compare the shapes while discussing the attributes and names of each. Then, the activity goes from whole group to our math tubs. 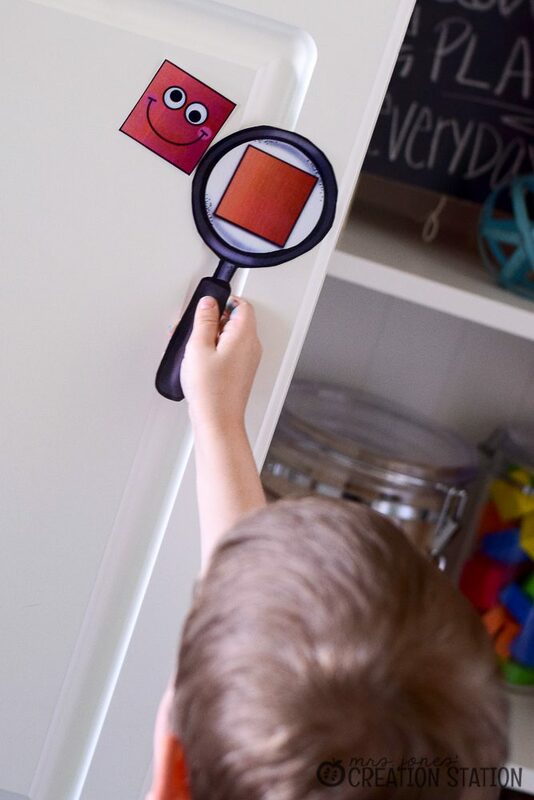 For this particular activity I like to take down the shape pictures and have learners search for real world shapes in our classroom while recording their results on a workpage. You will be able to find this extension in my Math Pack for Little Learners. I’m not a natural at math and sadly not a crafter either…I know…pretty pitiful. 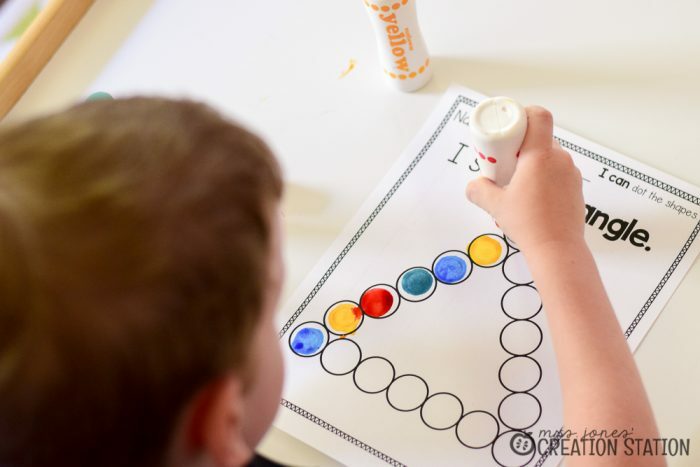 Those little artists in your room will love practicing their math skills with paint, paper, stickers and all things crafty. Creating learning opportunities like these may seem time consuming. But, if you keep a good stash of craft supplies in your room it’ll be simple. These Dot the Shape printables are perfect for introducing how to form shapes. Learners can get a better idea of the attributes of each shape when they use the bingo daubers to form the shapes. From sides to points or rounded shapes, they can focus on the perimeter of each shape while using some artsy and colorful fun! Worksheets are a must in math instruction. Learners have to put pencil to paper as they learn and practice math. But, most educators know that worksheets and workbooks aren’t going to help learners enjoy math. 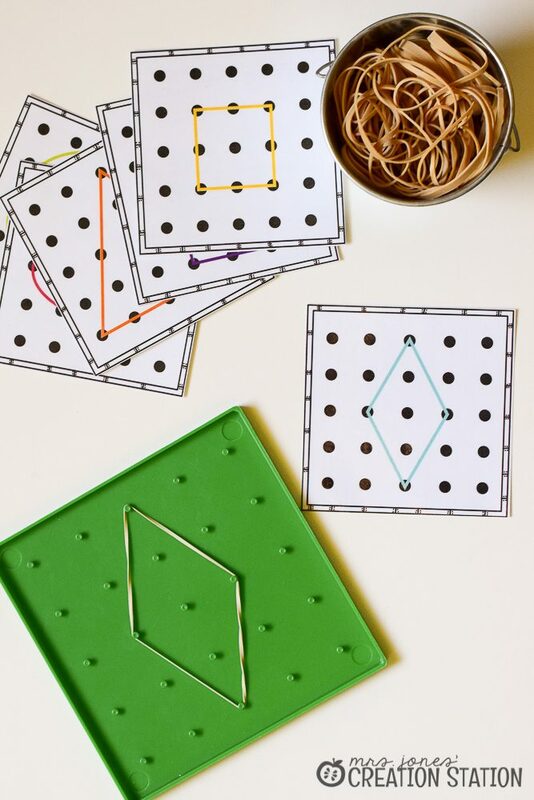 Try to provide hands-on math experiences with fun resources, like geoboards, or fun manipulatives. How many of you have a stock pile of Target mini-erasers?? If you don’t you need to start NOW! I love using geoboards in small group instruction and math centers. 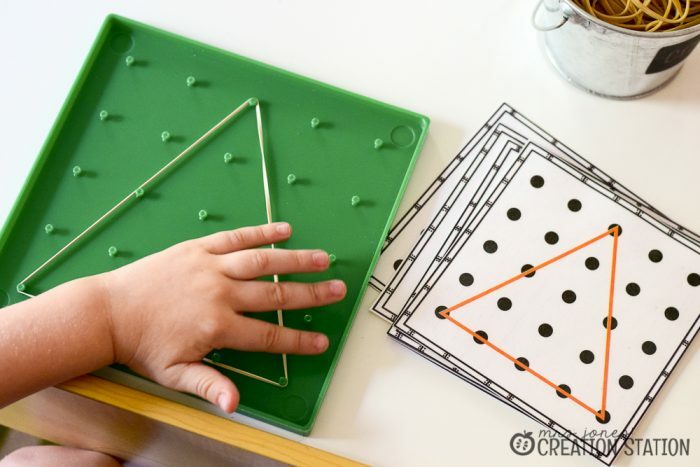 These Geoboard Shape Cards come in handy when we are forming our shapes. 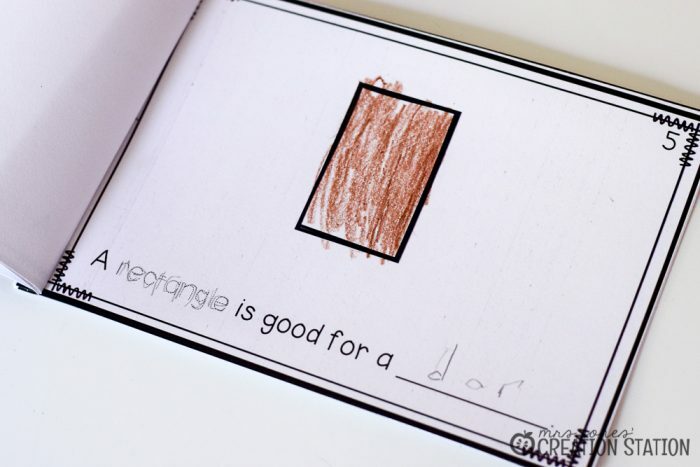 Learners are able to create the shapes by copying the diagram on the shape cards. There may be a lot of trial and error at first, but nothing beats how excited they get when they are able to create the shapes easily. As a teacher that can’t get enough of thematic units I am sure it is no surprise I like to integrate math and literacy. Shocker…I’m sure! Whether I provide an emergent reader or learners create their own book there will be reading in our math block. 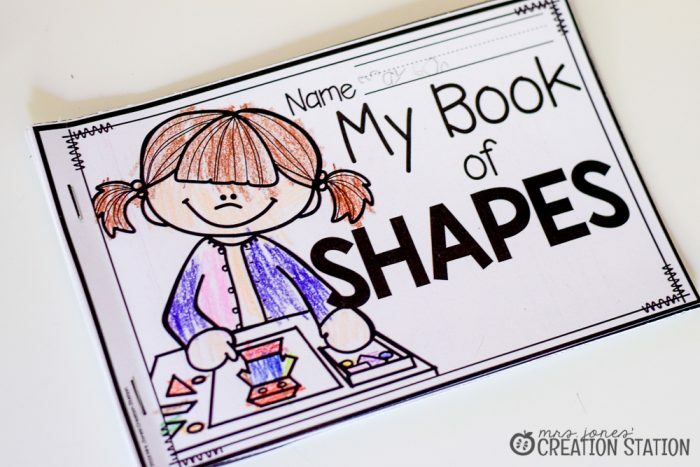 This Shape Book is one of my favorite shape activities and I like to use this book throughout our study of shapes. 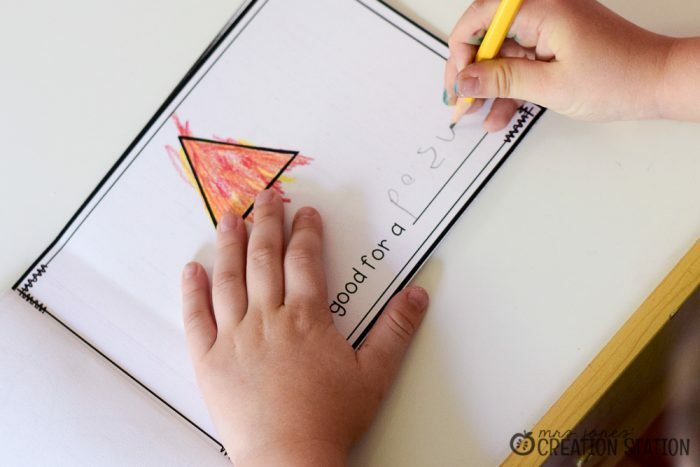 Learners will be able to use what they have learned, prior knowledge and writing to create their shape book. 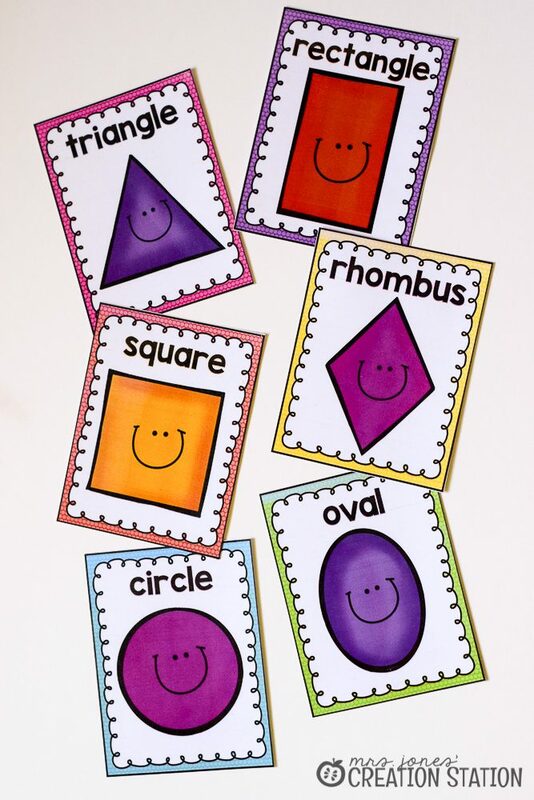 For each shape, learners will think of a real life object, color or draw a picture to show that object, trace the shape word and use their sounds to write the object they chose. It is so much fun to see what they come up with and how creative your little ones can be. Plus the added bonus of phonetic writing always makes my teacher heart happy! The math section on the MJCS website has ideas, resources and freebies that you can use to create engaging experiences for your learners. My Sorting by Attributes math unit available on my store is one of my top selling resources. Would your learners enjoy it? Little learners need continued practice with Number Sense to grow in their math skills. Get a year worth of math units by grabbing my Math Pack for Little Learners. You can never have too many math centers to keep math exciting. You can find centers in my Thematic Packs and my Monthly Centers Bundle. Thank you so much for this freebie! I can’t wait to use it with my kiddos to start school. Great resources, Thank you for the time and effort you used to make these! Thank you for Sharing. My daughter love to learn about shapes.. this is great can’t wait to start! Thank you again for sharing this with us! Hi! 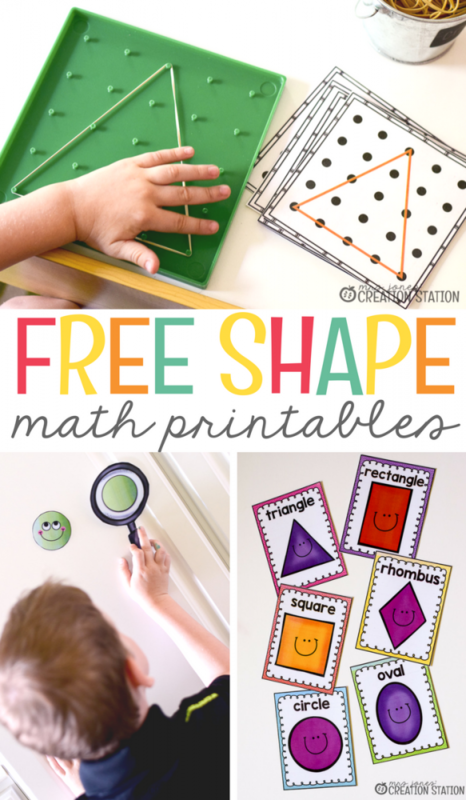 I love your shapes posters and activities!! I just printed the posters for my classroom. 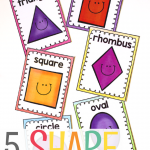 I was wondering if you have the same posters for the 3D shapes…cube, cone, cylinder and sphere? I would love them if you do so that all the posters matched. Thanks so much!! It appears to be working fine on my end. What internet browser are you using?